These fruity banana coconut muffins are perfect for breakfast, brunch, or just an afternoon snack. Both coconuts and bananas are naturally sweet, so this recipe uses less sugar than other muffin recipes. These banana coconut muffins are both vegetarian and vegan. You can use a powdered vegetarian egg replacer such as that from Bob's Red Mill, or a liquid vegan egg replacer such as Follow Your Heart VeganEgg. In each case, check the equivalents listed on the packaging to see what is equal to one egg. 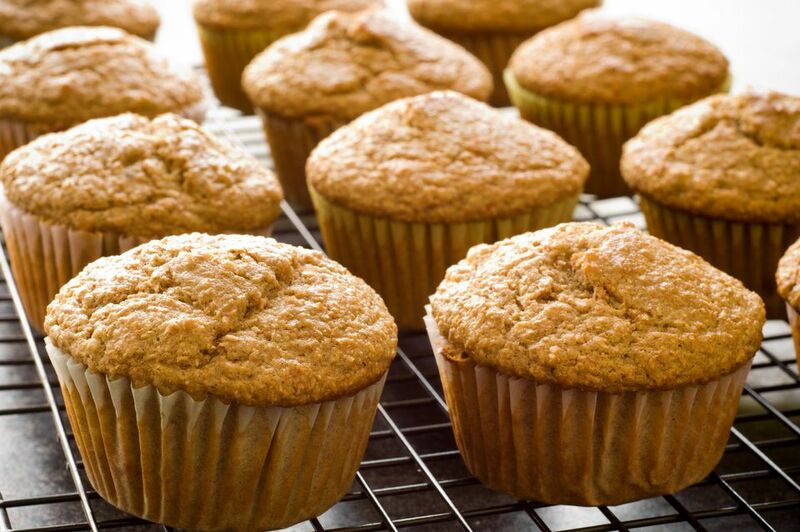 Extremely ripe bananas will give the best flavor for banana muffins. Buy the bananas several days before you want to make the muffins. While you can use them once they are completely yellow, you will have even more sweetness and complex flavors after brown spots have developed. A couple of well-mottled bananas can make a huge difference. This recipe makes a small batch of eight regular-sized muffins, or you can use it to make mini-muffins. Adjust the cooking time for smaller muffins so you don't bake them too long and they dry out or burn. In a separate bowl, cream together the margarine and sugar, then add the bananas, vanilla, egg replacer, and about 3/4 cup of the coconut flakes. Add the flour mixture to the bananas and stir to combine. Drop by spoonfuls into lined or greased muffin tins, and sprinkle the remaining coconut on top. Baked for 20 to 25 minutes, until lightly golden brown and a toothpick comes out clean when inserted. Enjoy your vegan coconut banana muffins warm or after they have cooled. Your muffins will be best fresh out of the oven, but they can be stored at room temperature in a covered container for two to three days. Covering will ensure they don't lose moisture as well as protecting them from pests. For longer storage, you can keep them in a covered container in the refrigerator for up to a week. Refrigerating will give them a firmer texture but you can restore them by briefly heating them in the microwave. About 20 to 30 seconds is plenty for each muffin. If you like them with a little vegan margarine, that will also ensure it melts. To freeze the muffins, separate them in layers with waxed paper or parchment in a container. They will be good for up to six months. Defrost them at room temperature or heat them briefly in the microwave.